Some shearing machines are very simple and they cut the metal simply by using the energy transferred when the operator presses down on the foot pedal, while others are hydraulically or mechanically powered. Within the machine itself, there are sectional knives or sliding blades that have the ability to cut cleanly through the sheet metal when they are forced down on it. Cutting isn’t always designed to take place on a perfect 90 degree angle since it actually requires less force to cut diagonally through the material. For this reason, many metal shears have angled blades. Metal is inserted into the shearing machine from the shear table, a work table upon which the machine rests. This table supports the metal as an operator slowly slides it into the machine for cutting. 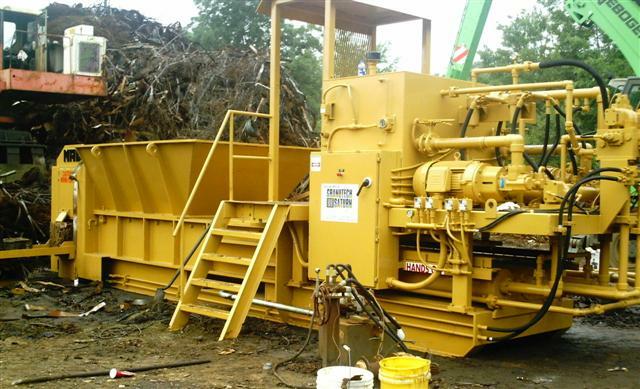 Some metal shears are mobile so that they can be moved around a scrap yard or large recycling facility, while others are built to be stationary and compliment a complete recovery process. Some metal fabrication shops receive large pieces of sheet metal directly from suppliers who have reclaimed it from other facilities or who no longer need it themselves. The workers in the fabrication shop can use metal shearing machines to straighten the edges of the metal or cut it down to a size that matches a set of specifications for a project they are working on. This is a much more cost-effective way to manufacture metal products than if the fabricators were to purchase 100% of their metal brand new. Some metal shear machines are built into large industrial balers, so that metals can be continuously sheared and baled in a large scale operation. Shearing in an operation like this creates metals in a more consistent size, which is perfect for baling since the idea is to have uniformly shaped and sized units for shipping.